Welcome to Argentina Polyglot Network! It comes from the Latin term “argentum”, which means silver. Located in South America, and thus, in the southern hemisphere, Argentina has an area of almost 3.8 million square kilometers making it the 8th largest country in the world. It is 3,800 Km. long. 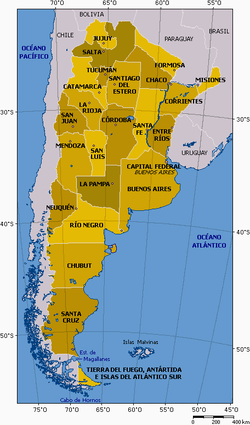 Language : Spanish is the official language of the Argentine Republic. In Buenos Aires, some “lunfardo” expressions -city slang - are used. Also many people know Portuguese, Italian, French or German. Climate : The country’s territory offers a wide variety of climates: subtropical in the North, sub-Antarctic in the southern Patagonia, and mild and humid in the Pampas plains. Media temperature from November to March is 23° C, and 12° C from June to September. Population : Argentina’s current population is more than 36 million inhabitants, almost half of which live in the city and the province of Buenos Aires. Population density calculated on a national basis is 13 inhabitants per square kilometer. Food : The food is one of the best in the world. Exquisite meat, pasta, pizza and empanadas. There is practically a whole culture about eating in Argentina. Many expatriates miss the food the most :-) and longs to eat a good asado (barbaque). Religion : There is complete religious freedom in Argentina, although the official religion is Roman Catholic. Other religions practiced in the country are Protestant, Jewish, Moslem, Greek Orthodox, Russian Orthodox and others. Currency : The official Argentine currency is the Peso. There are bills of 2, 5, 10, 20, 50, and 100 pesos, and coins of 1 peso and 1, 5, 10, 25, and 50 cents. Currently. 1 USD = 3,10 pesos. 1 EUR = 4, 11 pesos. Two historic dates : May 25, 1810. The first 'Gobierno Patrio' or National Government Assembly was constituted. July 9, 1816. Proclamation of Independence by the “Provincias Unidas del Río de la Plata”. Hi, I want to learn english, you? hola, me gusteria emparar el espaniol! Yo soy Italian!